You can never go home again. Joanne Walker has survived an encounter with the Master at great personal cost, but now her father is missing – stolen from the timeline. She must finally return to North Carolina to find him – and to meet Aidan, the son she left behind long ago. That would be enough for any shaman to face, but Joanne’s beloved Appalachians are being torn apart by an evil reaching forward from the distant past. Anything that gets in its way becomes tainted – or worse. And Aidan has gotten in the way. Only by calling on every aspect of her shamanic powers can Joanne pull the past apart and weave a better future. It will take everything she has – and more. 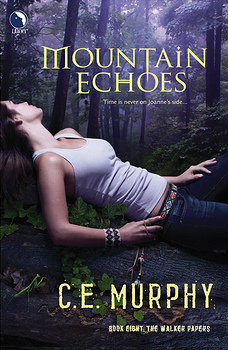 If Raven Calls was about Jo discovering her Irish Heritage, this book is about her discovering her Cherokee heritage. The vivid details in the setting sucked me in. I loved how the author described the Appalachian landscape, and how the Cherokee was connected to it. The struggle between traditions and the modern society that the author describe felt very delievable. The Cherokee nation was closeknit, which made sense to me. I also liked the suspicion that Jo’s return caused. Their wariness made total sense, since she had been… prickly during her stay in Qualla boundary. In some ways, this book is about healing and making amends. I liked how she slowly started to build a relationship with her son, Aidan, at the same time while assuring his adoptive mother that Jo wasn’t there to usurp her place. I also liked how returning to Qualla Boundary made her look back at her time there during high school, and reflect over the mistakes and memories she had made. And there was Morrison. I loved the interactions between him and Jo, I felt like their relationship became more solid. The plot was a fast paced, and deliciously complex. The plot was fast paced and deliciously complex. I loved how the fast pace threw unexpected twists a Jo, and forced her to discover new aspects of her gifts. The painful history of the Cherokee was a big theme in the plot, and I loved how Ms Murphy described how the pain had affected both the past and the present. The biggest problem I had was that sometimes Jo did things that defied physics, which boggled my mind, since I couldn’t understand how she could do that. And, no, I am not talking about her gift to travel through time.